Have a seat. Any seat. Bassett's Custom Dining Side Chairs are literally made for you, so choose from any one of 7 body styles, 30 finishes, and 30 seat options (upholstered seat also available in store). Diamondback 19"?Wx23"?Dx39"?H, Florencia 19"?Wx24"?Dx36"?H, Lattice 19"?Wx24"?Dx37"?H, Louis Phillippe 20"?Wx23"?Dx36"?H, Transitional 19"?Wx23"?Dx40"?H, Vertical Slat 19"?Wx22"?Dx38"?H, and X Back 21"?Wx23"?Dx37"?H. Seat height is standard 18"?. 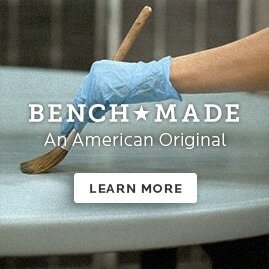 What"?s more, Bassett"?s entire Custom Dining collection is made just for you. Mix and match 30 rich finishes and over 800 fabrics to reflect your personal design aesthetic. In addition to 7 chair body styles, you"?ll find pedestal, rectangular and square tables with stone, glass, copper and Arts and Crafts glass tops, metal or wood bases, and 14 leg styles.